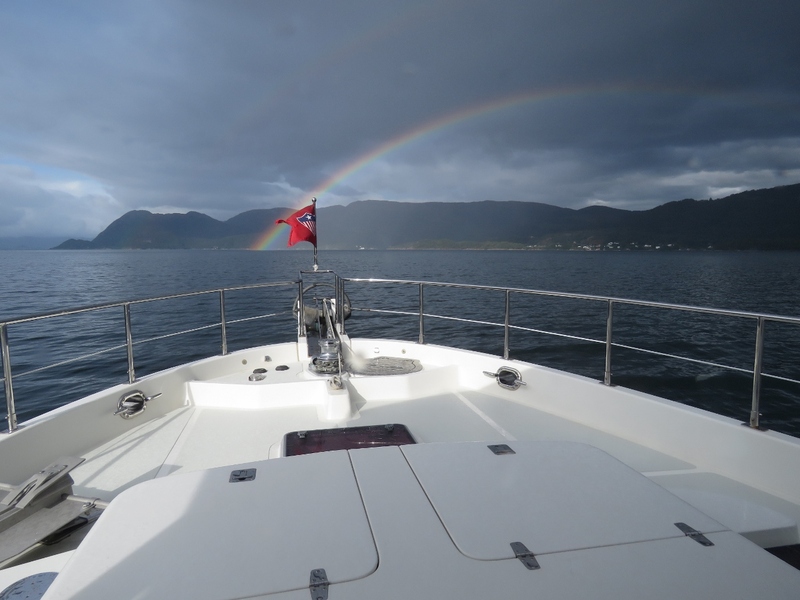 On May 11th of this year, we passed north of 61°30′ latitude and returned back south of that line recently as we approached the Bergen area. 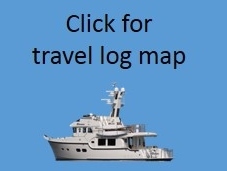 This latitude is significant because our insurance policy, Jackline, explicity excludes travel north of this without purchasing an additional rider. 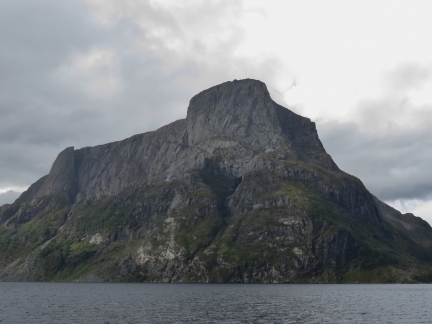 Prior to this, the farthest north Dirona had ever been was 61°16′ when we visited Prince William Sound, Alaska. 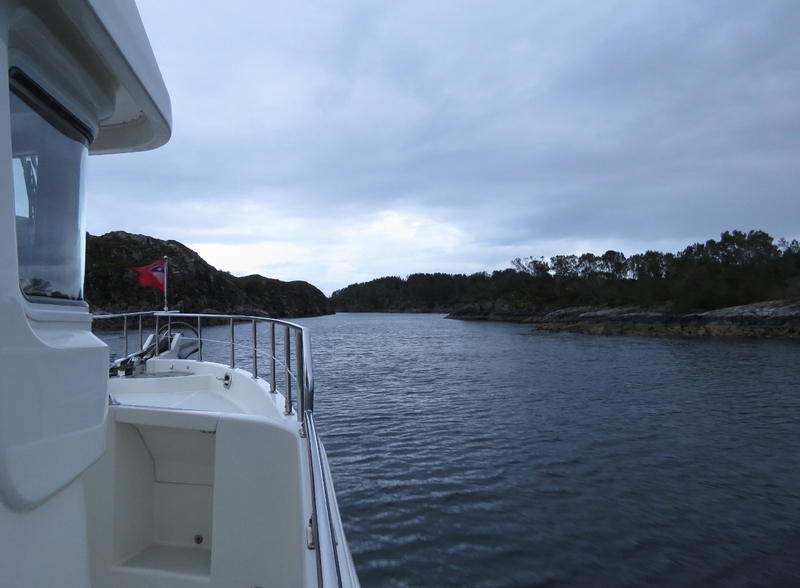 In spending the past four months north of 61°30′, the waters we travelled felt overall much less exposed than many other places we’ve visited. For the most part we didn’t feel particularly “out there”, even though we were well above the Arctic Cirle for much of that time. 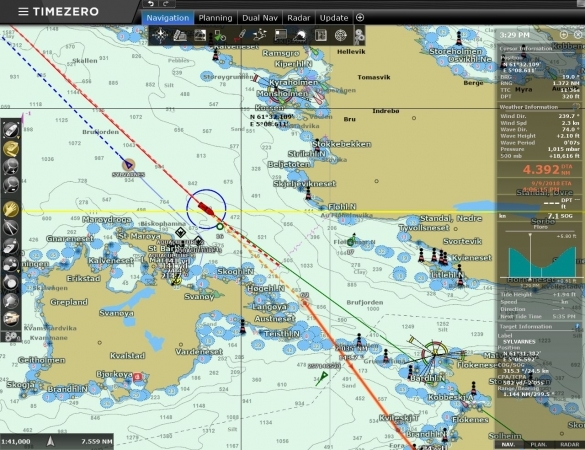 Generally we travelled in sheltered, inside waters with relatively few open ocean runs. 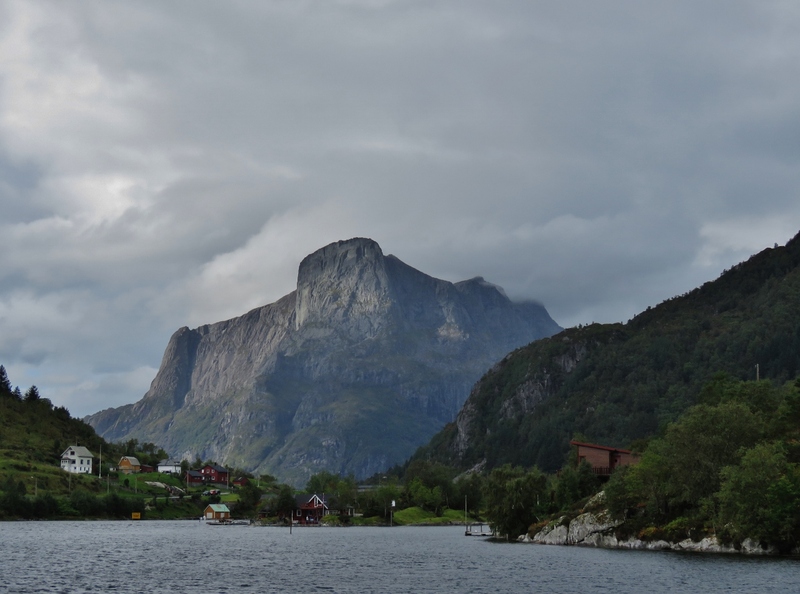 This was one of the many enjoyable aspects of cruising Norway that we will miss. The all-electric ferries Eidsjford and Gloppefjord that we passed en route to Loen. 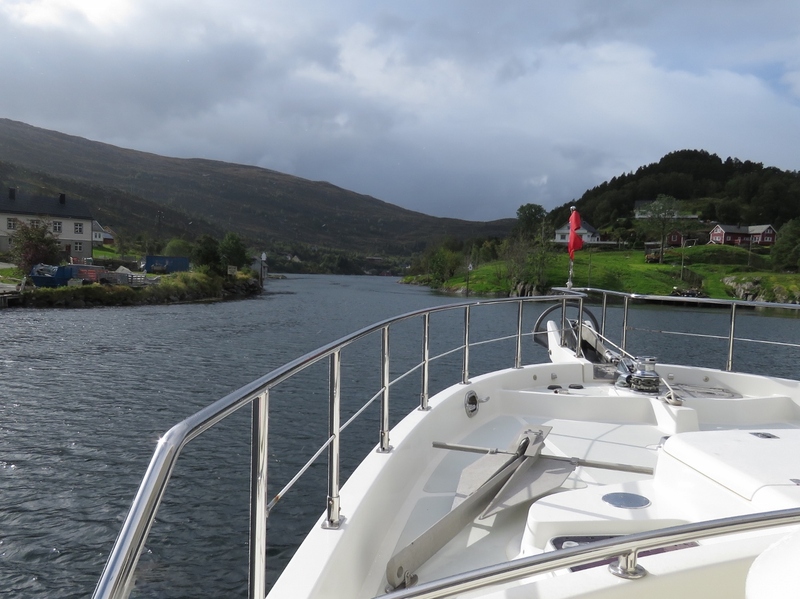 Approaching the narrow and shallow Straumen Narrows. We had a little current to contend with as well, but the channel is well-marked and relatively easy to run. 2821ft (860m) Hornelen, the highest sea cliff in Europe, burst into view as we cleared Straumen Narrows. 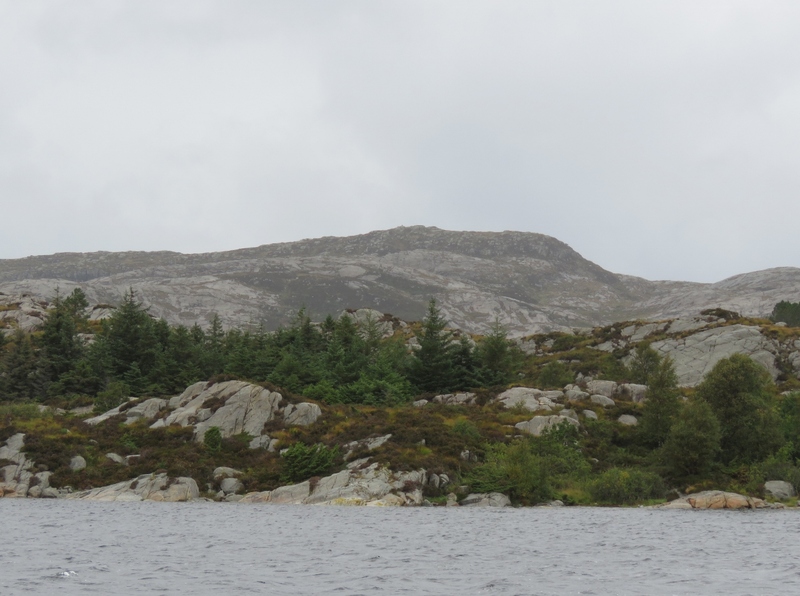 Another view to 2821ft (860m) Hornelen as we pass. 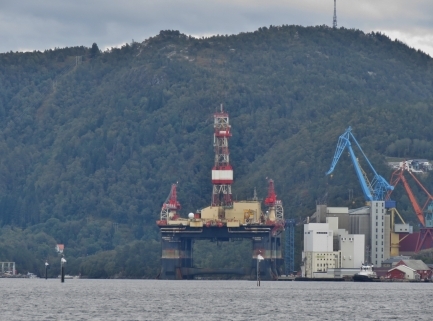 Oil rig moored at Floro, likely for maintenance. 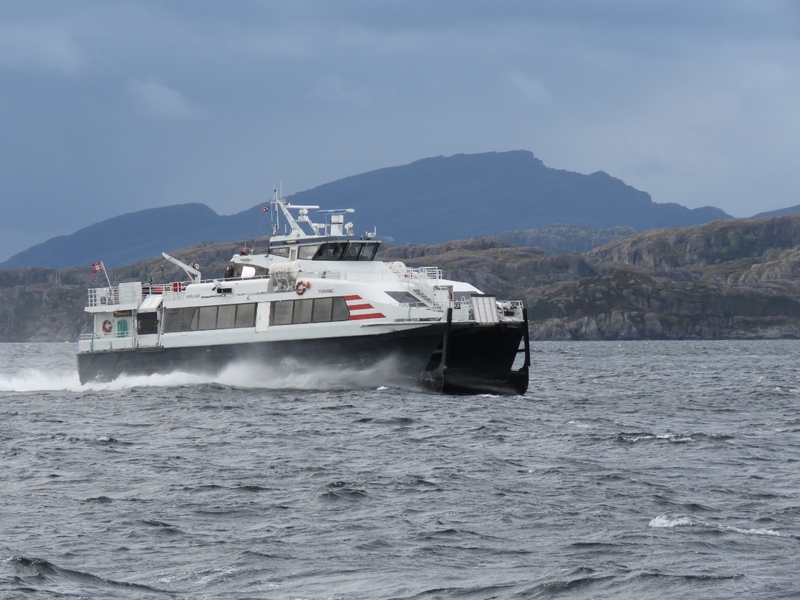 The fast ferry Sylvarnes off Floro. Huge EWOS facility in Floro. 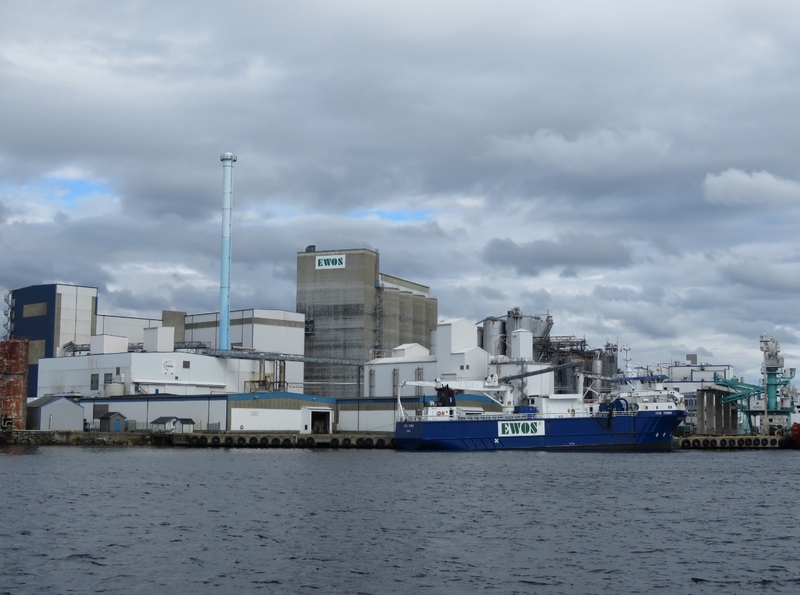 Until purchased by Cargill in 2015, EWOS was one of the largest suppliers of feed and nutrition for farmed fish. The yellow line we’re crossing is the standard limit for our Jackline insurance policy. We needed to purchase a special rider to travel north of 061°30′ latitude. 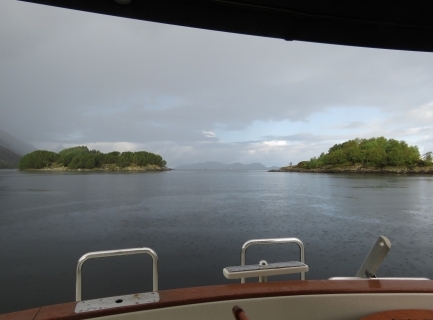 The view north towards Floro from the anchorage at Naervika where we’ve stopped for a few nights while a weather system passes. Rain has been falling heavily since we arrived. The work boat Bruvaer departing from Naervika. 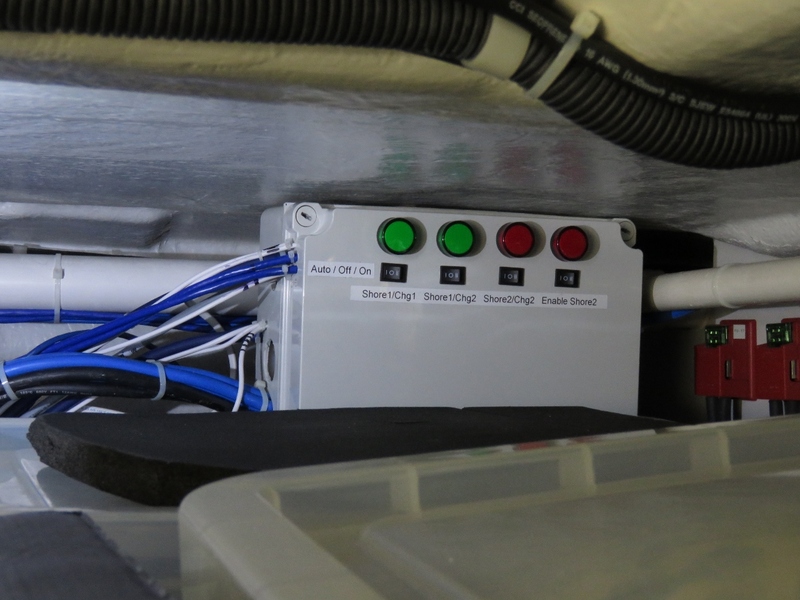 The finished second shore power control box. This control box is used for a variety of functions including: 1) Manual control of the second shore power connection with electrical interlocks preventing two power sources to on the same charger, 2) automatic control of the second shore power connection with electrical interlocks, 3) load shedding support for both charger #1 and #2, 4) 8 channels of digital output (future use), 5) digital control for a 4×20 character LCD display (future use), 6) digital control for a 4×4 matrix keyboard (future use), and 7) a single digital input (future use). 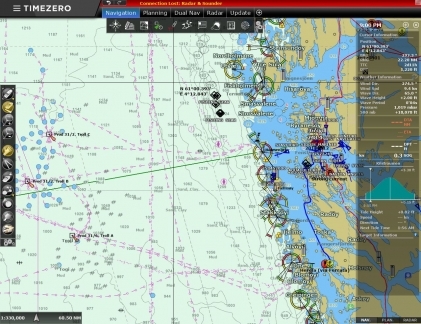 The 4 lights indicate: 1) left green indicates charger 1 is powered by the house and is on, 2) right green indicates charger 2 is powered by the house and is on, 3) the left red light indicates the presence of power at the second shore power connection and it’s selected (can’t be on at the same time as the green light beside it), and 4) the far right red light is lit when shore power two is powering charger #2. The 4 rocker switches control, from left to right, charger #1, charger #2, shore #2, shore #2 enable. Each switch can be in auto control (switched left), forced off (switched centrally), or manually on (switched right). This is the finished product showing at a glance if the system is online in automatic mode, manual mode, or forced off. 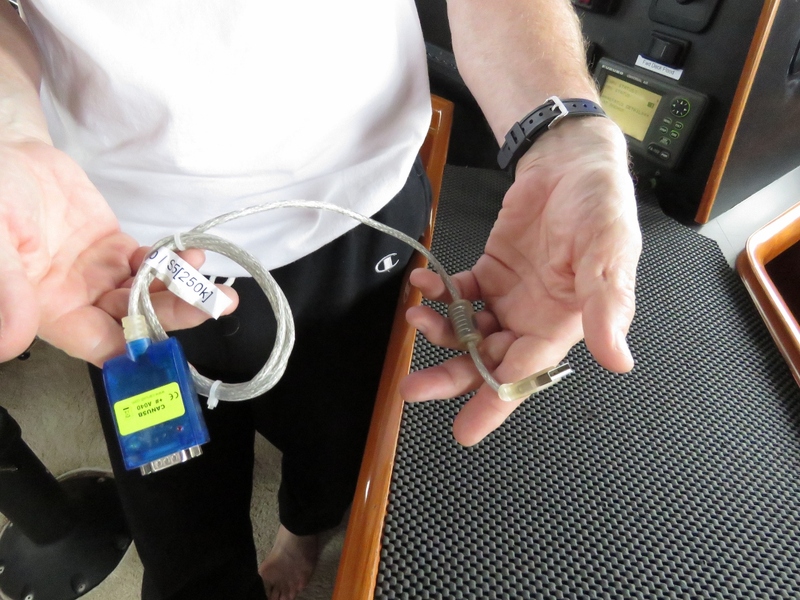 It also shows if the chargers are powered and, if so, whether it’s from the house or from the second shore power connection. 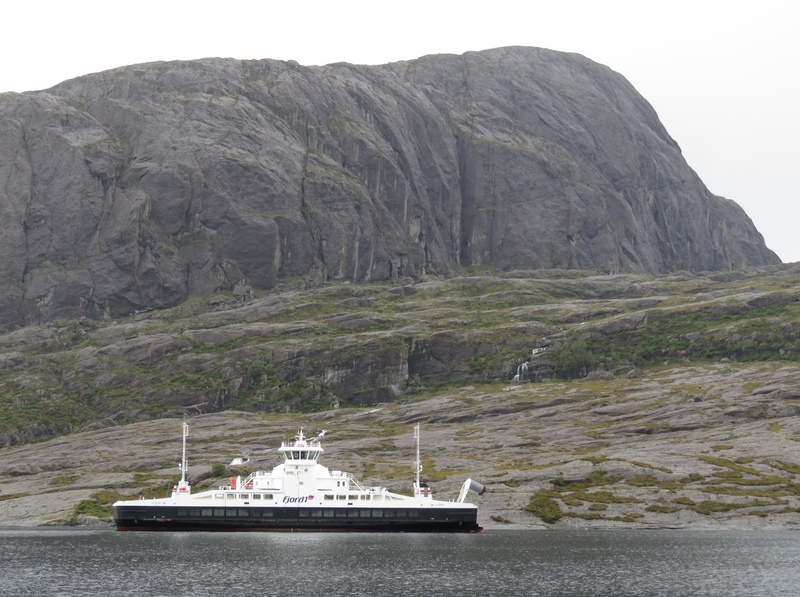 This is also remotely visible from the pilot house. Back in 2016, we figured out the proprietary Mastervolt Masterbus communications protocol and used a CANbus adapter to turn the chargers off and on programatically as loads changed on the boat. This has worked very well for years but there is a device driver problem with the CANbus adapter where Windows will rarely decide is a mouse. When this happens the cursor jumps all over the screen as CANbus messages arrive. It only happens once a month or two and a reboot always clears it but it’s annoying. We’ve been using the new second 16A shore power adapter control box which can switch in the second up to 16A shore power connection but it also has a contactor controlling the power sent to each charger. 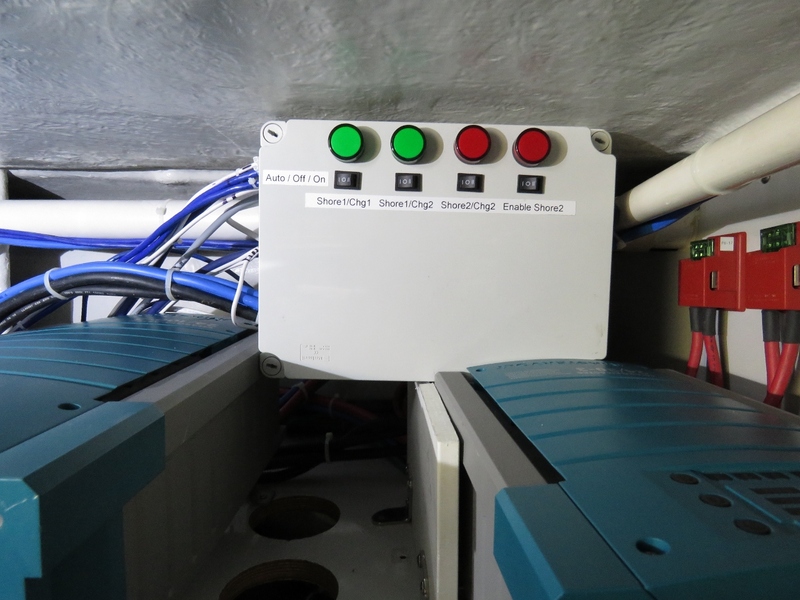 This control box implements the second shore power system with interlocks but also implements the load shedding system for the chargers. This load shed system is slightly faster than the direct control of Masterbus that we had been using and it doesn’t suffer from the driver problem. Since it’s working well, we removed the CANbus adapter today. We just changed the generator impeller five months back, but the generator is running at 196F at full load and it normally runs around 193F. 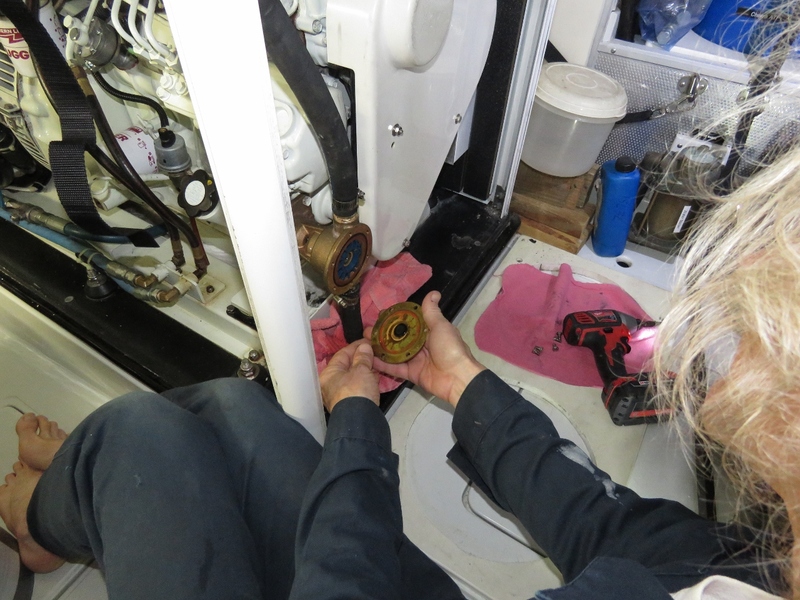 Each time we see that temperature creep up, we open up the raw water pump and each time find the impeller needs changing. The advantage of finding the fault early is the impeller parts may not yet have fallen off so the changes is quick and easy. 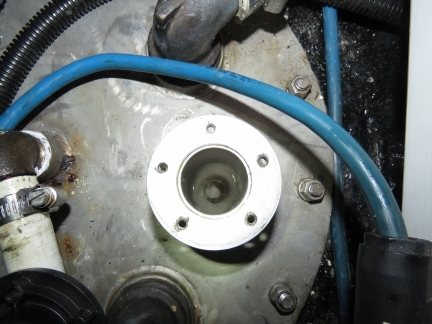 If we don’t notice until later and the impellers parts are released into the system, it’s a bigger job where the coolant needs to be drained from the generator and the heat exchangers needs to be opened up. That’s where the parts end up falling. Today, we found the impeller was 100% fine. We checked the temperature sensor accuracy and it appears to be reading correctly so the generator is just running about 3F warmer than usual. Not really a big deal at all but these things are usually an early warning that something is just starting to fail. We’ll check the air filter to make sure its clear and, after that, the most likely culprit is the exhaust elbow carboning up and restricting flow. We’ll keep an eye on it and, if we see any more evidence, we’ll drop the exhaust elbow and clean it. 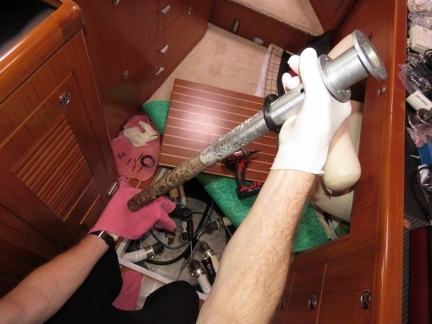 Given our generator averages 45% to 50% load and spends 1/4 of the time at full load, we wouldn’t really expect the exhaust elbow to carbon up. The reward for a couple of days of steady rain is impressive waterfalls on the hills behind the anchorage. 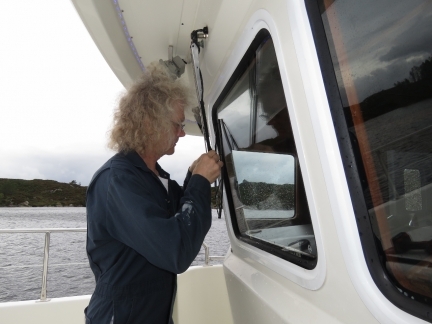 The winds peaked last night at just over 30 knots. 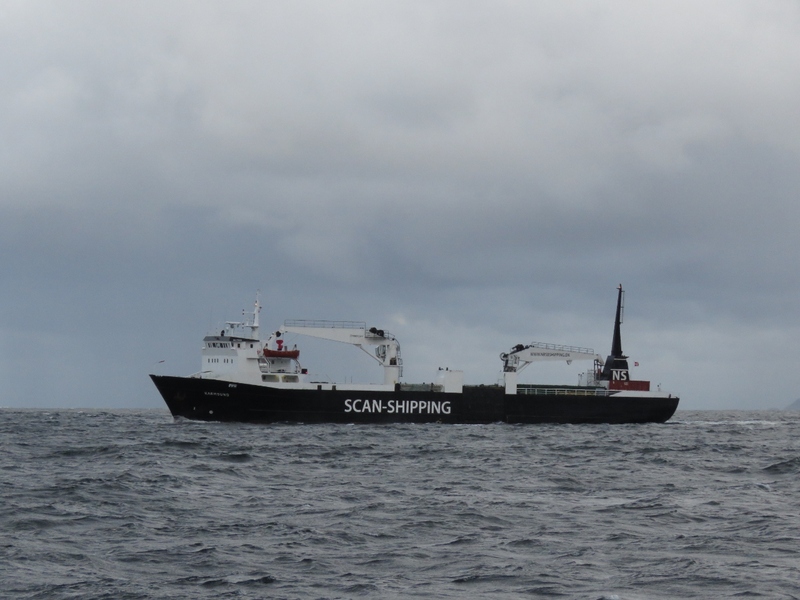 The coastal freighter Karmsund passing us as we both exit Stavjforden. The winds are steady in the 20s and the seas are quite large—the ship was rolling quite a bit in the beam seas. Conditions were surprisingly rough in Stavjforden, with tight seas on the nose. We were pitching up to 15° at times. As we turned sideways to the seas, the pitch started to fall off and we rolled more (see graphs at center). 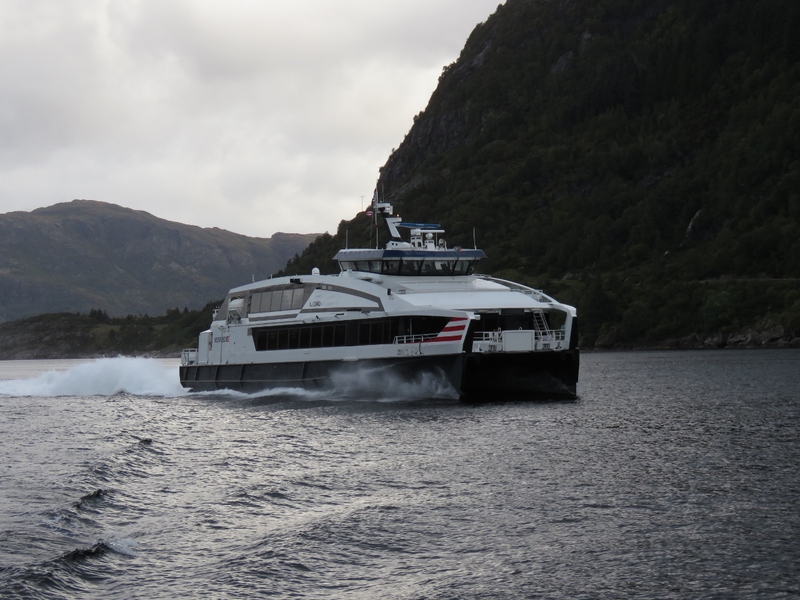 The fast ferry Njord doing 31 knots en route to Bergen. 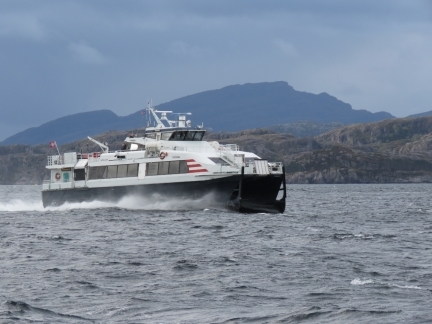 The fast ferry Tyrving heading north from Bergen. 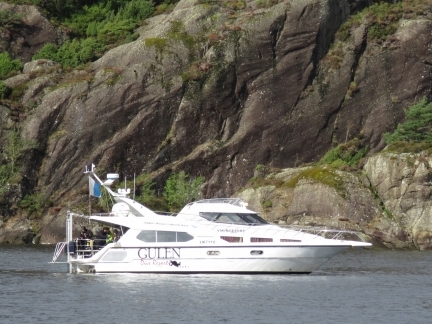 Divers on a Gulen Dive Resort boat in the channel Krakhellesundet. 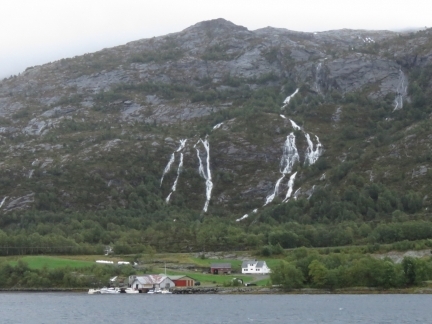 We’re just about to pass the mouth of Sogneford—where we cruised our first Norwegian fjord in early May. 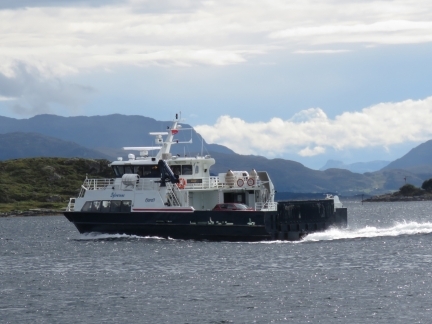 The ferry Losna arriving into Krakhella with bow lifted. The view north from the anchorage at Vikingevagen. The scenery is notably different from what we’ve had for the past few weeks: gentle hills instead of steep slopes and soaring mountains. 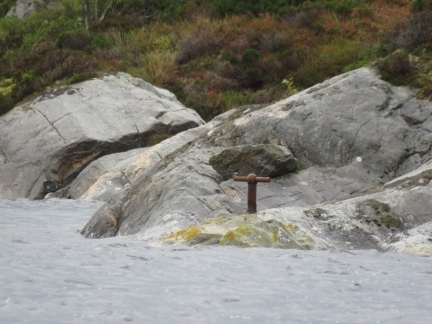 The anchorage at Vikingevagen is full of these mooring bolts. 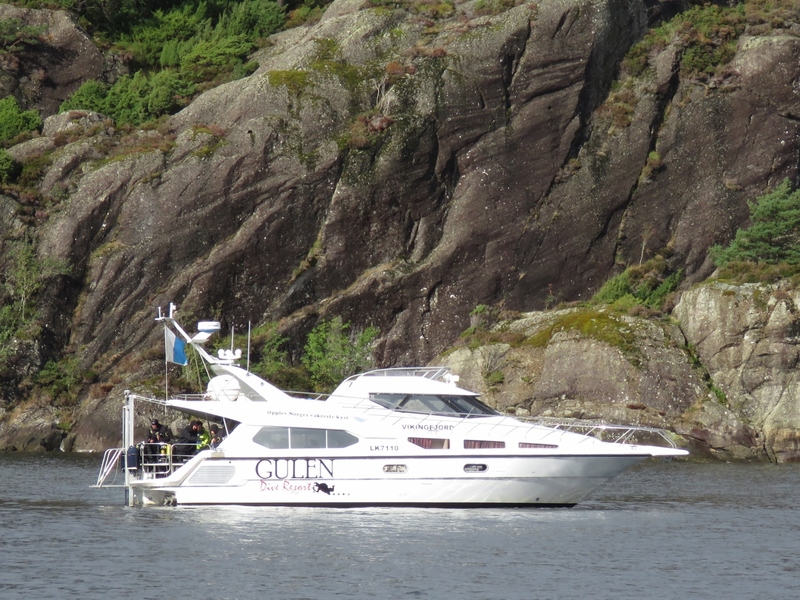 When swing room is restricted, it is common practice in Scandanavia to anchor off the stern and tie the bow to shore. This is common in the Pacific Northwest as well, except boats typically are anchored off the bow with the stern secured to shore. With the heavier Nordhavn, we generally prefer to swing free off the main anchor and haven’t been stern-tying as much as we did in the previous boat. 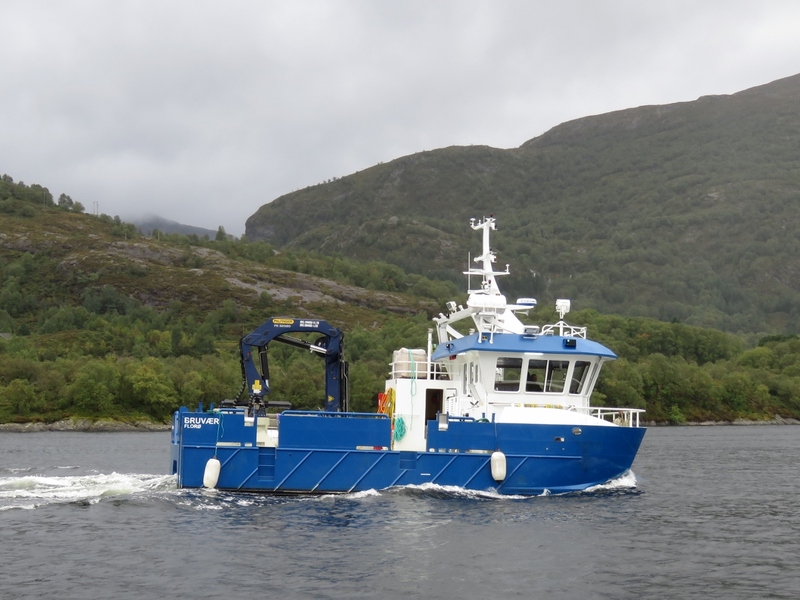 This is the last phase of a planned project to have the boat network and all control systems be able to survive a 120V network inverter outage without any negative impact. Most of the networking equipment is supported by the UPS that supports the nav computer and display systems, but there were a couple of networking switches that were still 120V-powered and two of the five Raspberry PIs run off wall warts (120V plug in transformers). In this final stage of the project we brought 24V into the entertainment system area from the ER (through a proper breaker). This 24V DC power is independent of the 120V inverter and related systems, so now a 120V outage will leave all control systems powered and fully operational. The only equipment that goes down in a power outage is the Synology network file store and the IP-powered security cameras, neither of which are considered mission critical. With this final stage of this project complete, we shut off the 120V inverter and got no alarms or faults (other than “120V inverter failure”). A mass of pipelines visible on the chart just south of our anchorage at Vikingevagen. The pipelines head to the Troll field, one of the biggest in the North Sea and holding 40% of Norway’s natural gas. 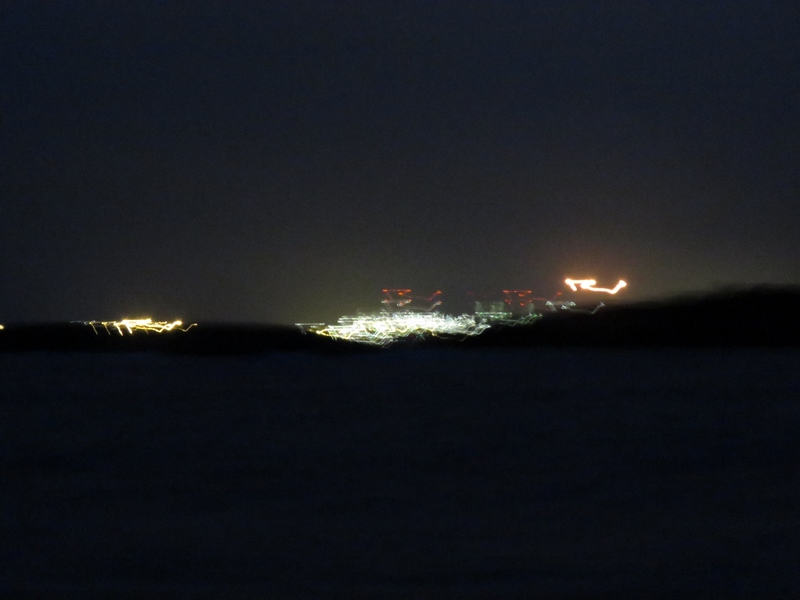 The blurred lights of the Statoil Mongstad industrial site visible in the distance as we’re heading south before sunrise. The charted pipelines terminate here. 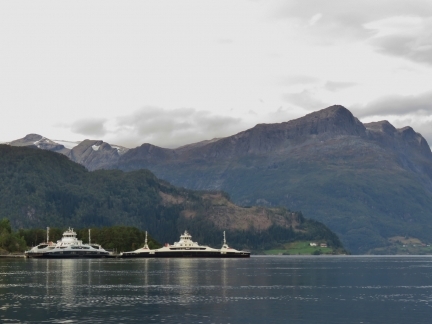 Mongstad is the largest refinery in Norway, with a capacity of 12 million tonnes of crude oil per year (230,000 barrels per day). 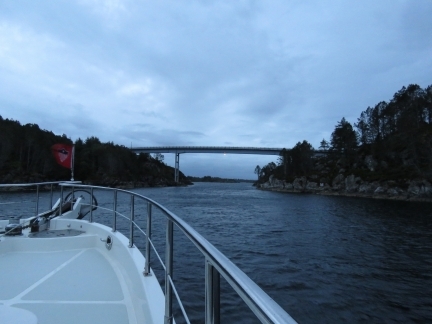 Passing under the bridge over narrow Bukkholmsundet. The clearance is 52ft (16m), so we have plenty of room to spare with our 30ft air draft. 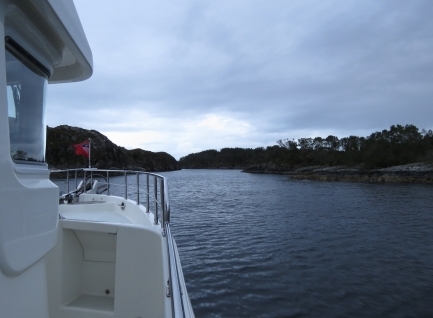 Approaching the narrow channel between the islands of Rikstadoyni and Syltneset. We really enjoyed the day’s cruise through this complex groups of islands and were reminded very much of our cruises through Queen Charlotte Sound in northern British Columbia, Canada. The black water tank sensor started failing again after we’d installed the focus tube and has been reading at 47 gallons for a long time now. We took it apart today and found a plug floating in the focus tube. James pulling the focus tube out of the black water tank to investigate the cause of the plug. We suspected the cap might have fallen off the end, but that wasn’t the case. What appears to be happening with the black water tank focus tube is that each time the tank is pumped out, some debris collects in the bottom of the tube and dries. Each time it dries the plug becomes thicker. 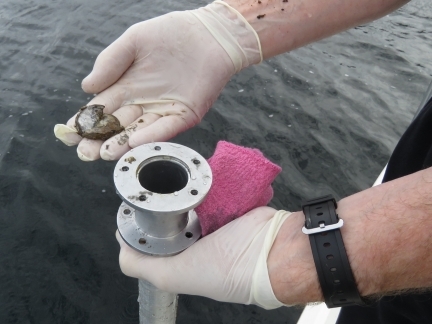 The plug is lighter than water so floats and it’s soft and uneven so it won’t allow a good reflection from the surface. We’ll try it one more time. Failing that we’ll try it without the end cap. The downside of running without the end cap is bigger debris can get it but the upside is it’s far less likely to form a floating plug. If it fails every 6 months, we’re fine. If it fails more frequently, we’ll try the cap off. If it continues to fail, we’ll look for a different solution. 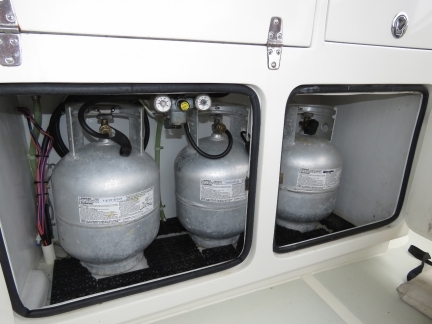 To supply our propane barbecue and cooktop we carry four 20lb propane tanks, three in the locker under the barbecue and a fourth in the aft port cockpit locker. Two are plumbed into the house system with a valve between so we can quickly switch the house from an empty to a full tank. Today we we ran out of propane on the main house tank, so switched over the next propane cylinder and exchanged the empty one with the last full one not connected. We now have 2x 20lb full cylinders left. We filled all four in Florida in February of 2017 so we got 1 year and 7 months from 2 or roughly 9 months for each 20 lb container. At that rate, we’ll run out in April 2020. These nice aluminum containers were new in 2008 so they are now outside of their certification. Given they are US cylinders and will require a new inspection and new hardware to refill in Europe, we’ll instead try a new strategy. We’ll get European hoses and buy disposable steel EU tanks and just use them and replace them when the next need filling. We went with propane because we didn’t want to have to run the generator for a quick use of the stovetop. But from our subsequent experience with a 240V inverter, we’d likely go all electric if we were to do it again. Propane is one more thing to purchase, is a hassle without a car, and can be a real pain outside North America with different fill attachments. Those 4 20-lb tanks do take up space, and propane is a fire hazard. The windshield wipers were worn and needed replacing. Today we completed an item that has been on our todo list since early 2017: create a backup of our router. 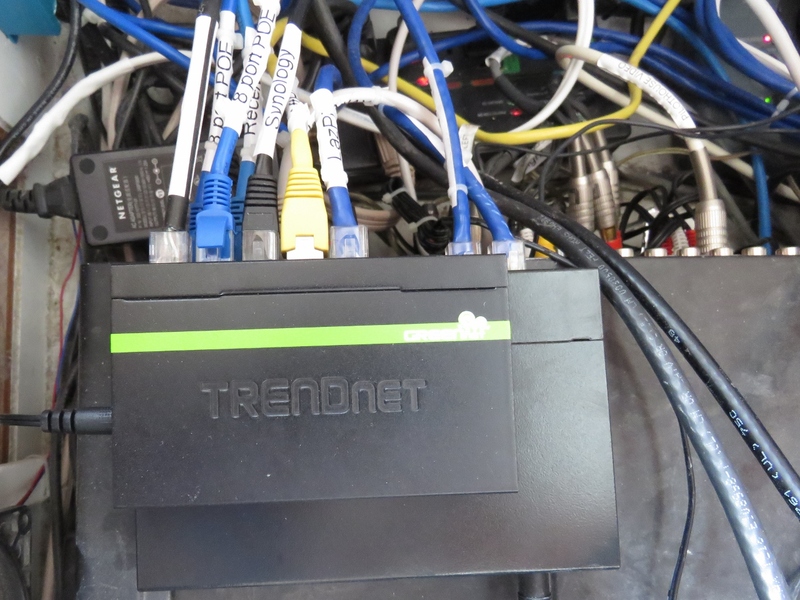 We’re highly-dependent on the functionality of our custom router and do have spare hardware. But it just has the base Netgear R7000 firmware—we needed to upgrade to DD-WRT and install all the changes we’ve made to implement our customizations. Most of our changes are in software that we can just copy over, but some of the configurations settings must be in non-volatile RAM (nvram). Spitfire is keeping a watchful eye for typos or slopping programming. After loading DD-WRT on the backup router, we copied our source code changes over and modified a script to transfer the nvram configuration from one router to another. And we now have a fully-functional backup router. 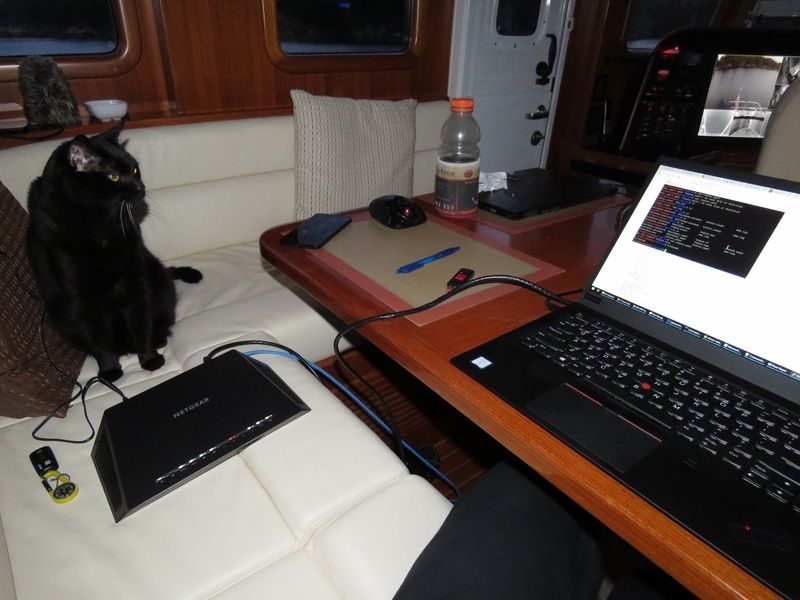 Now that we have the new Lenovo P320 Tiny navigation computer up and running well for a few weeks, we can get rid of all the spares we had for the old navigation computer, including CD drive, processor, memory, and network cards. 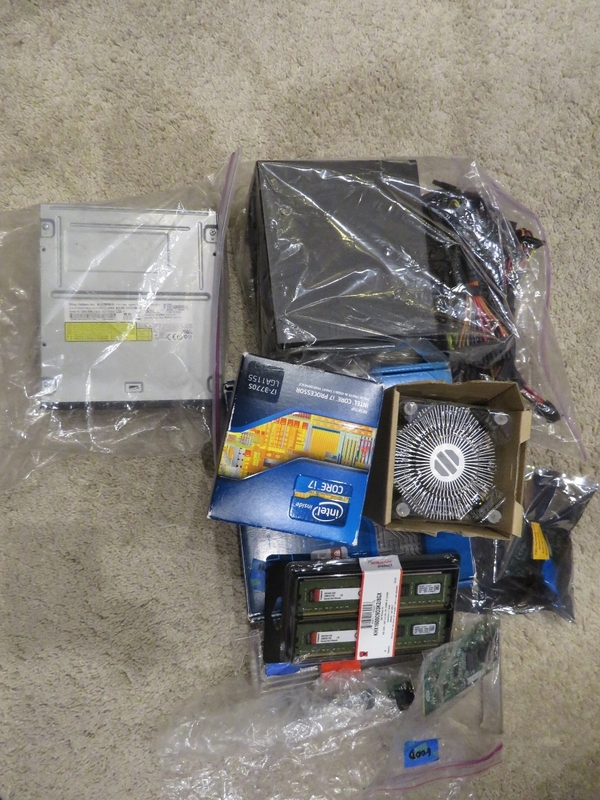 It seems wasteful to discard all this unused computer gear, but it dates back to 2012 so really isn’t very useful. Regarding using an electric grill vs gas, have you followed the idea far enough to identify the electric grill you’d get ‘next time’? Im on the fence for our new build and would love your input. Hi Van. We’ve never gotten serious enough about electric grills to do the research on them so haven’t much to offer on electric BBQ options.